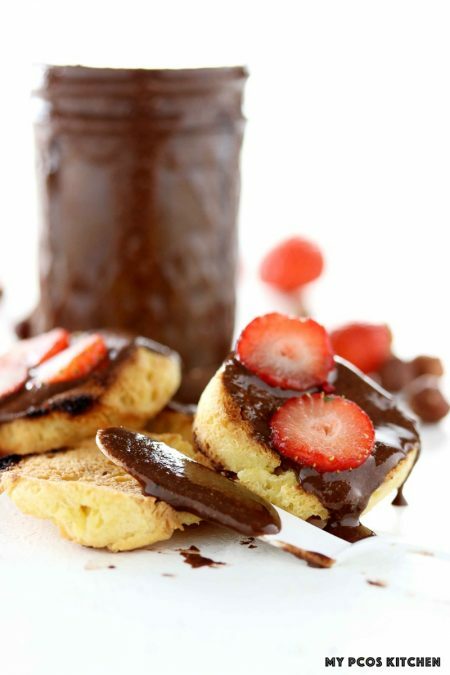 With this easy Sugar Free Nutella recipe, you won’t even miss the original! 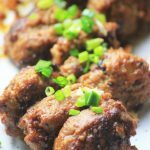 This recipe was originally published in May 2016, but I have republished it with new photos, instructions and a better recipe! I’m not even kidding when I say that. It doesn’t matter what kind of nuts you try to make sugar free Nutella with, hazelnuts are hands down the best option for it. They go extremely well with chocolate flavours which is what inspired me to make my Keto Triple Chocolate Cheesecake which featured a chocolate hazelnut crust and chopped hazelnuts on top. I love making this spread as it’s so versatile! 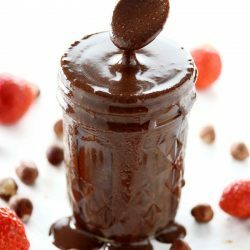 You could use it as a chocolate Fondue for Valentine’s day and dip some low carb fruits in there for a nice treat! Spread it over toast, crepes or waffles, or even eat it by the spoon! Not going to lie, I’ve done it multiple times! 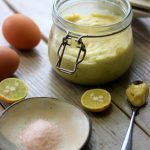 Since it’s full of healthy fats, a tablespoon fills you right up! Ever since I started making chia parfaits, I’ve been trying to find good toppings or sauces that would go well with them. At the grocery store, I was looking at a jar of Nutella and thought to myself, wouldn’t it be nice if this had no sugar, milk, or soy? Wouldn’t it be amazing if they sold low carb Nutella at the stores? That would be a dream! 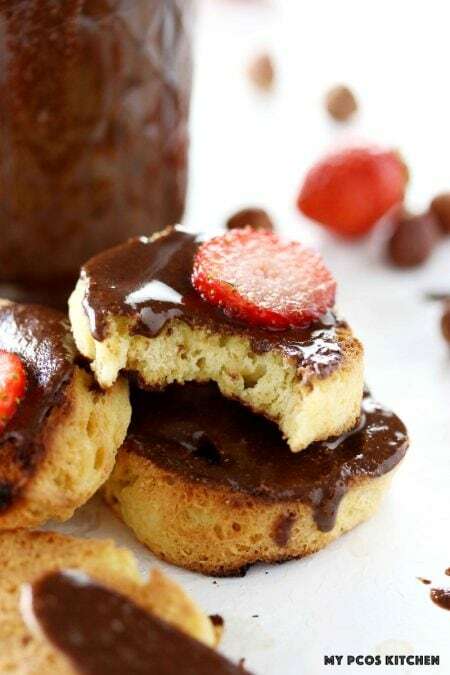 Then I realized that it’s actually quite easy to make homemade sugar free Nutella as you only need hazelnuts, cocoa powder, a sweetener and coconut oil. Making low carb Nutella is quite easy. 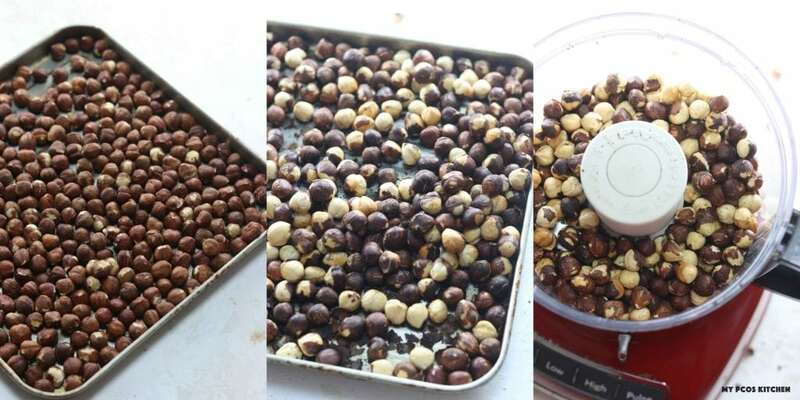 The first thing you want to do is add your fresh hazelnuts to an oven tray and roast them in the oven for 15-20 minutes. By roasting them, they’ll be easier to cream as their fat will be nice and warm. Once the nuts are roasted, 50% of the shell will come off. You do have to rub the nuts together so that the shell can come off, though. I used some kitchen towels and rubbed the nuts together while they were still hot until most of the shell came off. The next step is to add them to the food processor. You can see in the picture that the shells didn’t come off the entire batch of hazelnuts. That’s okay. Just try to remove as much as you can. The trick to a runny chocolate hazelnut spread is to process the hazelnuts in the food processor for a long time. You need to own a powerful one obviously, but the longer you process the nuts, the creamier it’ll get. I processed my nuts for about 10 minutes. I like to add some coconut oil during the flour stage so that it’s easier for the food processor to chop up the nuts into a cream. After the hazelnuts have become butter, I add the cocoa powder and the sweetener for process for a couple more minutes. I was debating on whether to use stevia powder or erythritol, and ended up going with powdered erythritol. The erythritol really made it seem like it was actual sugar and it tasted just like the original! It also added a bit of thickness to it, whereas with stevia it would stay more liquid. That’s it. It’s as simple as that. It takes 20-30 minutes of your time and then you’re guaranteed to have the best chocolate hazelnut spread ever! When you’re done processing everything, just add it to a glass jar or Tupperware and store in the fridge to cool. The spread will thicken up a bit in the fridge, but not by that much. Low Carb Nutella Every. Single. Day. 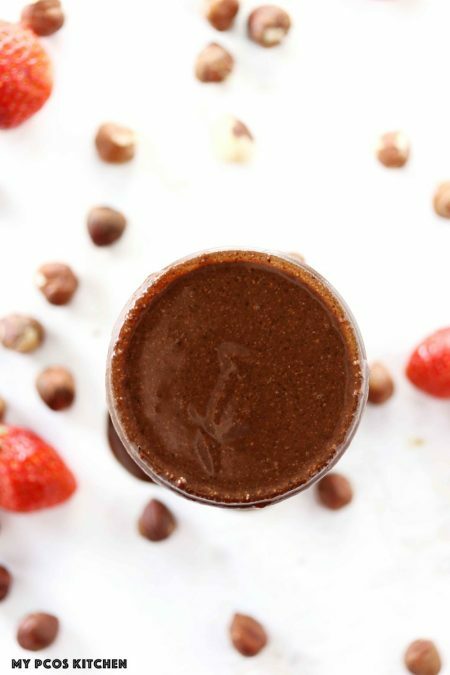 I love to use this low carb Nutella recipe and add it to either smoothies or chia puddings. I added it to the bottom of my Raspberry Chocolate Chia Parfait which I like to eat for breakfast. 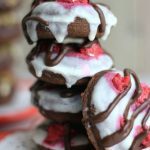 Chocolate goes so well with raspberries, so I definitely recommend making it! It’s delicious, dairy free and fills you up for hours! Now that you know how to make Nutella, what kind of treats will you make with it? 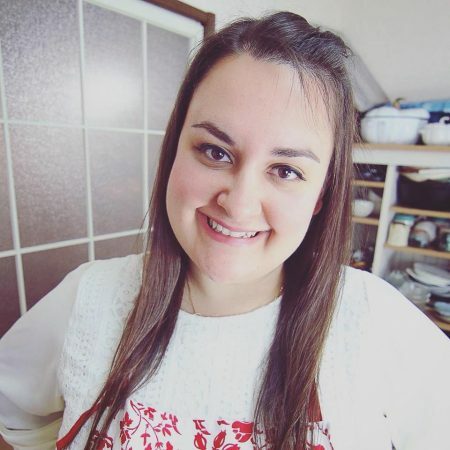 This week I’ve been making lots of Cloud Bread and 90 second bread recipes and spreading a couple tablespoons of my Sugar Free Nutella all over. When I feel like a little cheat, I dip some strawberries in it!! 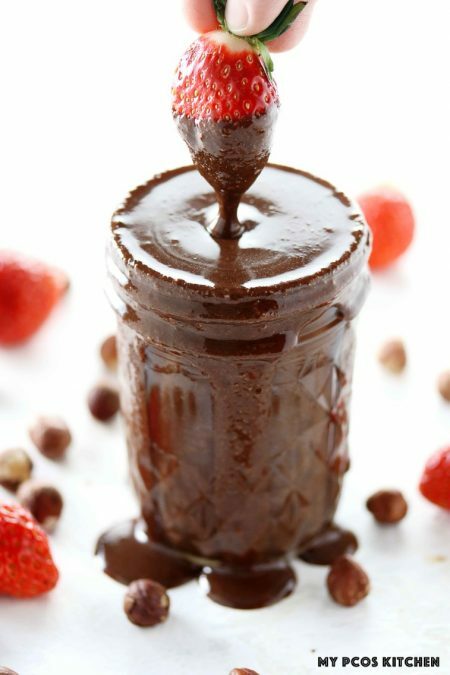 This delicious chocolate hazelnut spread is the best sugar free alternative you'll ever try! Add the hazelnuts to an oven tray and bake at 160C/320F. Bake for 15-20 minutes, checking them after 10ish minutes and every so often to make sure they haven't burned. Take the tray out of the oven and with a towel or oven glove, rub the nuts together so that they lose their shells. Not all of the nut's shells will fall off and that's okay. Just try to remove as much shell as you can! Add the hazelnuts to a powerful food processor and process for a minute until it's flour. Add the coconut oil to the food processor and process for a good 8-10 minutes. Scrape the sides from time to time. The longer you process it (and the stronger your food processor) the smoother your nutella will be. I like mine really smooth and runny so I processed it for about 10 minutes. 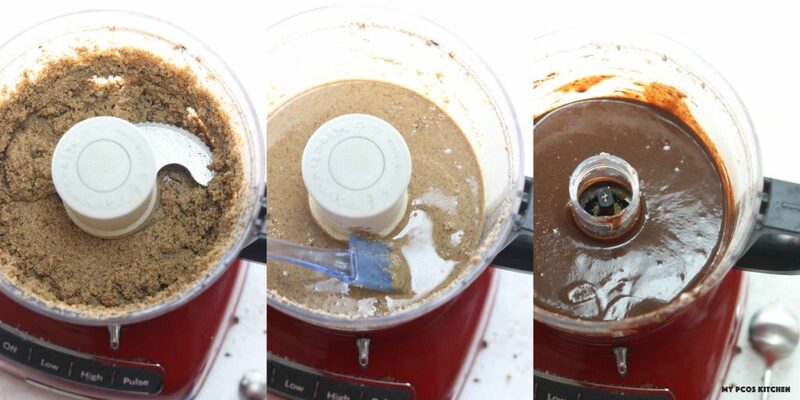 Add the cocoa powder and the erythritol to the food processor and process for an additional 2 minutes. It's now done and ready to serve! Store in the fridge in a jar or tupperware. It should keep for 3-4 weeks. Hi Caryn, you could skip adding the oil or not process it as long in the food processor. The longer you process it, the smoother it will be. I buy raw ones, roast them and take out as much shell as I can after they’ve cooled down a bit. I think the confusion may be because Mira is using the term “shell” to refer to the brown papery skin that surrounds the nutmeat, not the hard outer part that has to be cracked open with a hammer or nutcracker. Hazelnuts are commonly sold raw with the brown skin still on. The brown papery skin is very hard to remove completely but is best done by rubbing in a kitchen towel while still hot from the oven. However, it has become more common to see “pre-roasted” nuts. I know Trader Joe’s (U.S.) sells both raw and pre-roasted hazelnuts. Those would not need to be roasted a second time and already have much of the brown skin removed. It produces a cooling effect if you add too much of it. You can still use truvia, just taste test with your finger to see how sweet you want it. The only difference is that the virgin one will give you a coconut taste. I tried this recipe this morning and added vanilla, dash of salt, unsweetened vanilla cashew almond milk, more sweetener and coconut oil. I used my Blendtec and the final result was very smooth and delicious. It is very similar in taste to Nutella. My husband loved it. We made low carb waffles from Carbquik and added the topping and whipped cream. Delicious. If you want to cheat when you’re off your diet add sliced bananas, which I did to mine. It was divine!